Idyllic clifftop setting overlooking rocky East Bay and surrounds. 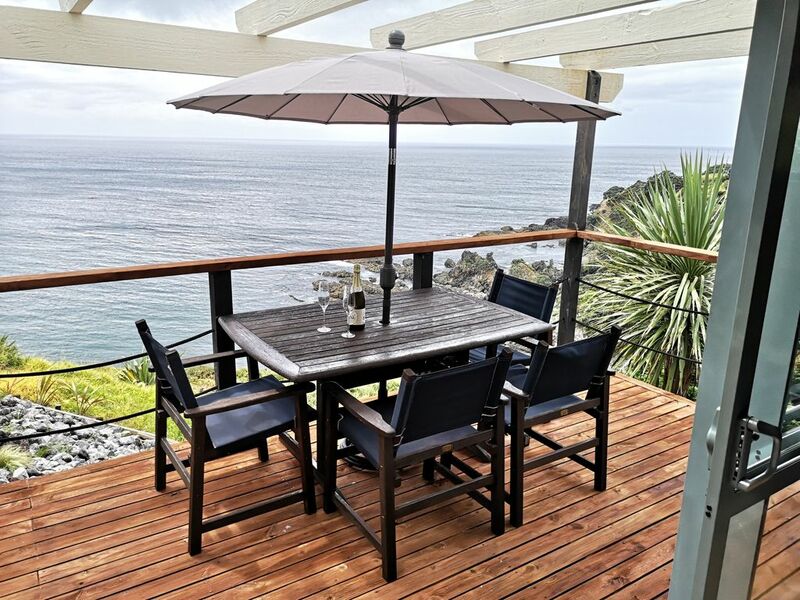 Hear and view the ocean and dolphins from within the cottage or from your deck, the views are spectacular and ever changing. The cottage contains all the usual conveniences including the SKY Sports channel, iPod base etc to make your stay comfortable. You are free to use our solar heated salt water chlorinated swimming pool, gas barbecue and covered barbecue area. Free wireless broadband and free anytime telephone calls within New Zealand. Just a 10 minute walk or 2 minute drive to Mahinepua Bay which offers safe swimming, kayaking, boating or fishing or just a lazy day on the beach and exploring the rocky areas at low tide. Tauranga Bay is 10 minutes away. If you are feeling energetic there is a DOC walk from Mahinepua Bay which is well worth the effort as it has the finest view in NZ. The famous Kauri Cliffs golf course is 15 minutes away and Whangaroa Golf Club 20 minutes. Other areas close by that are worth a visit are Tauranga Bay, Whangaroa Harbour, Marlin Hotel and Whangaroa Gamefish Club, Matauri Bay surf beach which also has a grocery store with a liquor licence and a restaurant if you don't feel like cooking and the delightful village of Kaeo, with its museum, craft shop, post office, chemist shop, licensed restaurant, hotel and supermarket is 15 minutes away, The substantial town of Kerikeri is a 40 minute drive, perhaps a visit to their famous Sunday farmers and craft market? A day trip to Cape Reinga via the famous Kauri Gum museum and cafe and onto Houhora takes you to the top of NZ and is a must, on your return a stop-over at the delightful fishing village of Mangonui, featuring the world famous 'Mangonui Fish Shop', which not only has the freshest fish in New Zealand but a tempting variety of home made gourmet seafood delights which are just irresistable. A small house trained dog is fine with prior approval but definitely no big dogs. Free broadband wireless and anytime national 'phone calls. Smoking only allowed on outside deck. The sofa bed will sleep two extra people. The cottage has its own parking area which can accommodate two vehicles and further room is available for boat trailer. Small dog OK, but no large dogs and no cats (we have 3 small poodles). NB: Two night minimum stay. We spent nearly three weeks in this little piece of paradise. The cottage is welcoming, exceptionally well-equipped, spotlessly clean, and most definitely has the promised stunning view of the ocean as well as a night sky filled with a million stars. We had mostly sunshine and blue skies & sparkling ocean with a few days of stormy weather for a change. The pool was lovely even on cool days. Kathy & Garry were the perfect hosts & we enjoyed our daily visits with the dogs! It's about a 40 minute drive to Kerikeri - a great town with a couple of nice walkways,- and a 2 minute drive to Mahinepua Beach & walkway. Matauri Bay beach is also not far and a perfect beach for walking, swimming, or boogie boarding. We recommend a boat tour of Whangaroa Harbour & perhaps the Lane Cove walk if you're feeling energetic. We enjoyed the cottage with its beautiful views. Cottage is very well equipped and clean and modern. Hosts were great, there if we needed anything but we had our own space to relax. Would love to come back. Their pool is beautiful for a dip also. Beautiful cottage with everything you need for your stay. Stunning beach nearby, great for swimming. Wonderful place to relax and marvel at the natural beauty around you. Looking forward to a return visit here to this slice of paradise. This place is just amazing. The cottage has everything a couple seeking a peaceful and restorative break could wish for. The north-facing view overlooks rocks and islands in the immediate vicinity, and a wide horizon with yachts and other boats in the distance. Kathleen and Gary are very thoughtful and respectful hosts, we had absolute privacy and everything we needed. The gardens are beautiful, bed comfy, kitchen well equipped, there's a pool available if desired, and a short drive took us to any one of quite a few wonderful beaches for evening walks. We look forward to coming again! Great location... sensational view.... wonderful to have Bernie and Marion helping too. This is one of those places that you dream about.